Isn't that the most important part? I figure, if I screw that up all else is for naught. 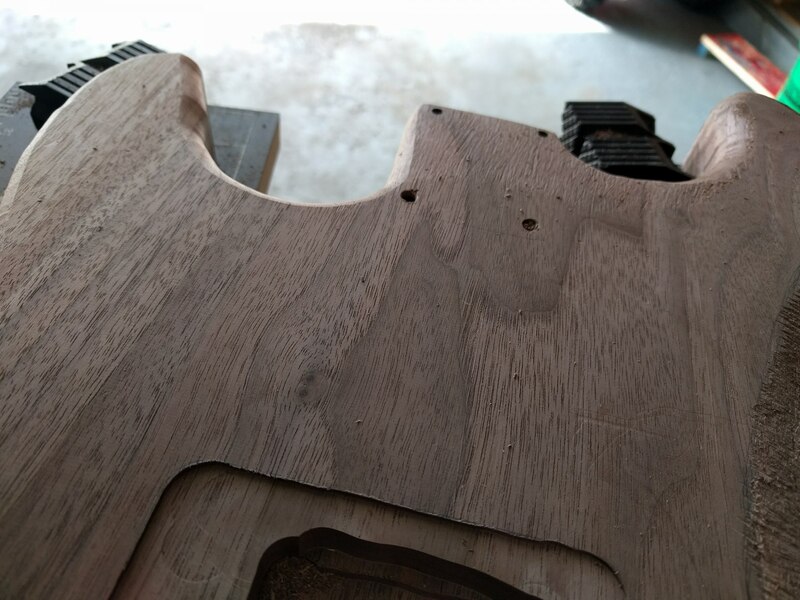 Any particular reason you routed the neck pocket before routing the body shape? Surprisingly, it's a very common technique or at least it used to be. 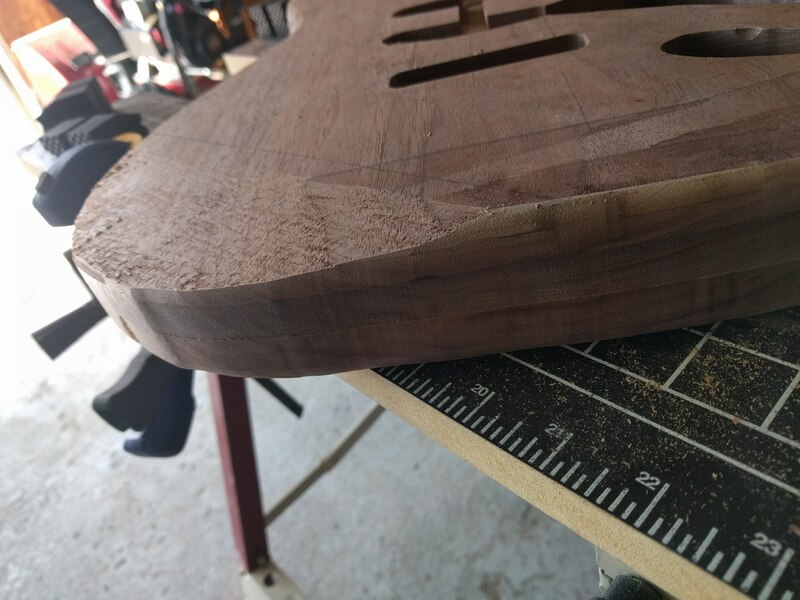 Neck pockets with no angle built in are convenient to rout when the body is flat since there's a lot more real estate for smaller router bases to ride around. I haven't seen people do this for a while. Two weekends in a row routing! 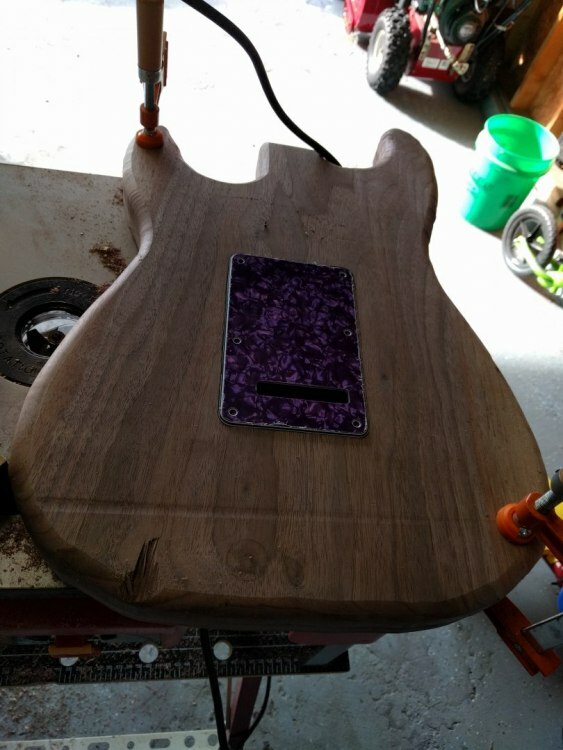 Used a stewmac template for the pickup pockets. Then I manually routed the electronics cavity, a little scary. Then did a couple test fits! I would've started on recessing the tremolo cover on the back, thinking manually again, but I had to go cook me some dinner. 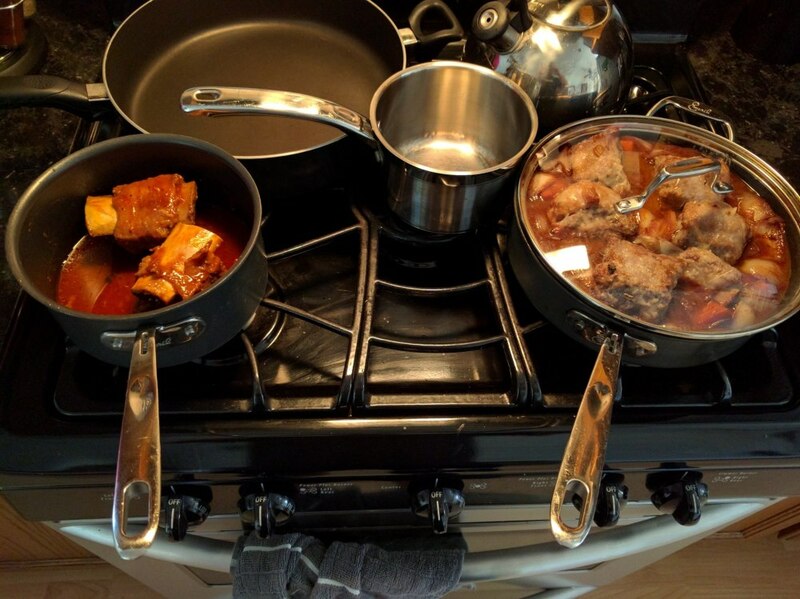 Some Wine Braised Short Ribs, from my other project for this year: make all the recipes in this. Yikes - no template for the cavity? 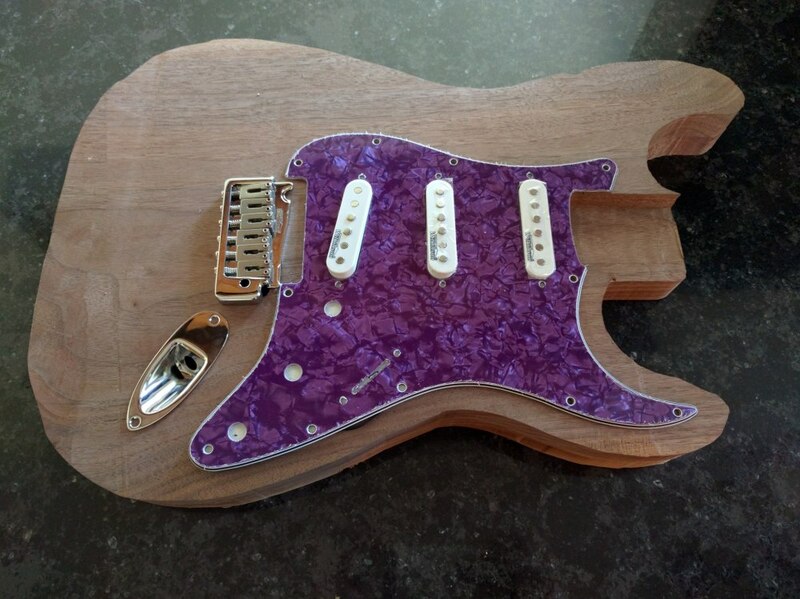 You should have made one from plywood to make sure it went smoothly! Braised anything. Yum. I fancy a goat curry now. 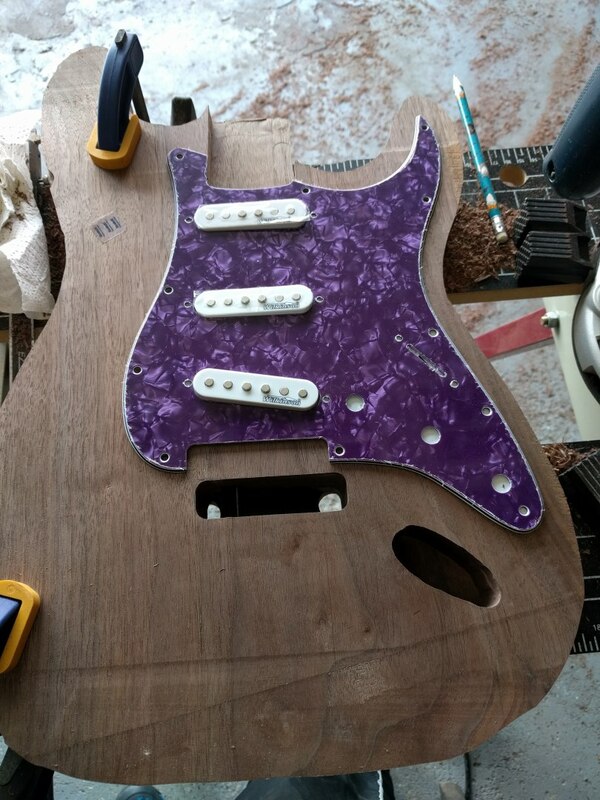 Rounded body edges and wait for...more freehand routing - starting to look like a strat! The router took a nice chunk out. Thinking about just carving it out...give it some character. 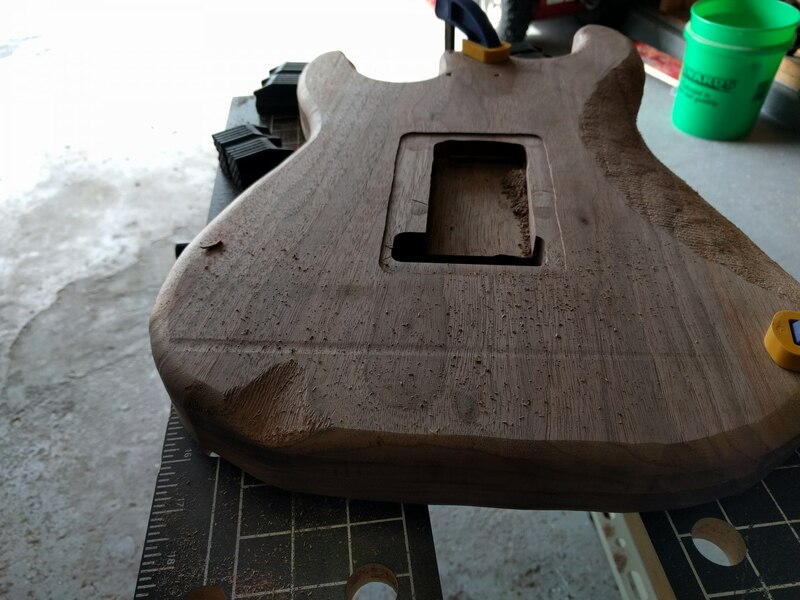 Sanding a little cable sized groove in there. Cosmetic problems aside, it should be interesting seeing how this finishes. 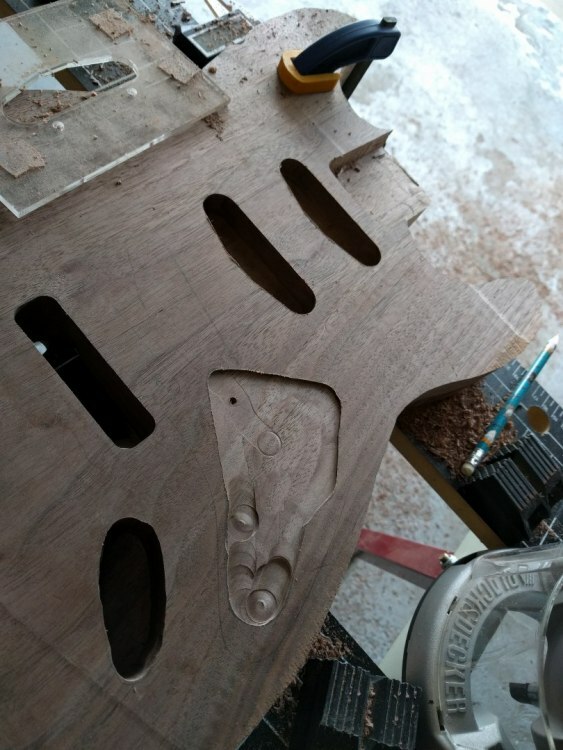 I have to say that I can't agree with freehand routing. You can quickly get into situations that are both dangerous and impossible to predict. Give us a shout if you need advice on NOT doing that! It's your choice of course, however we can't wish your fingers back. I gotcha there. 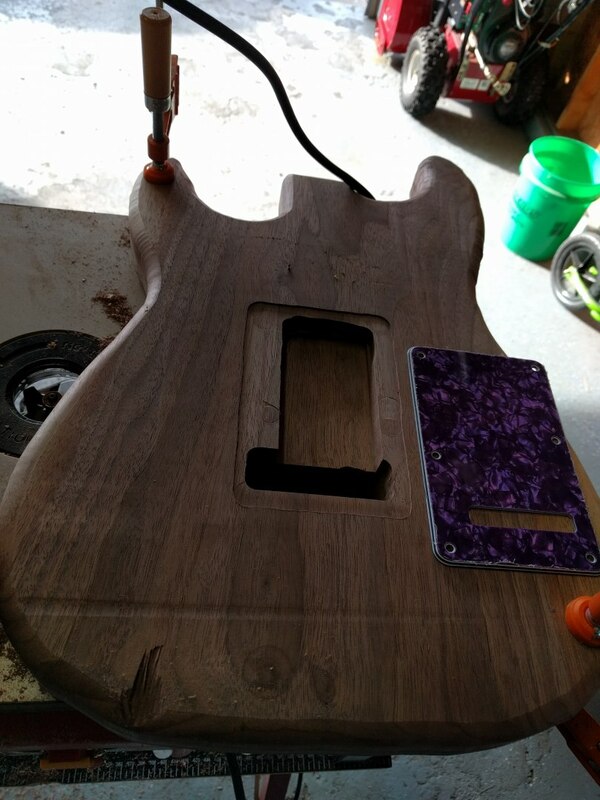 When I did the electronics cavity, I only when deep enough to give my flush trim bit something to ride on. As for yesterday, I only did .050-.100 deep. I was amazed at the steadiness moving it along my penciled lines...I do want to keep my fingers though. The problem is that, 9 times out of 10 it goes fine. 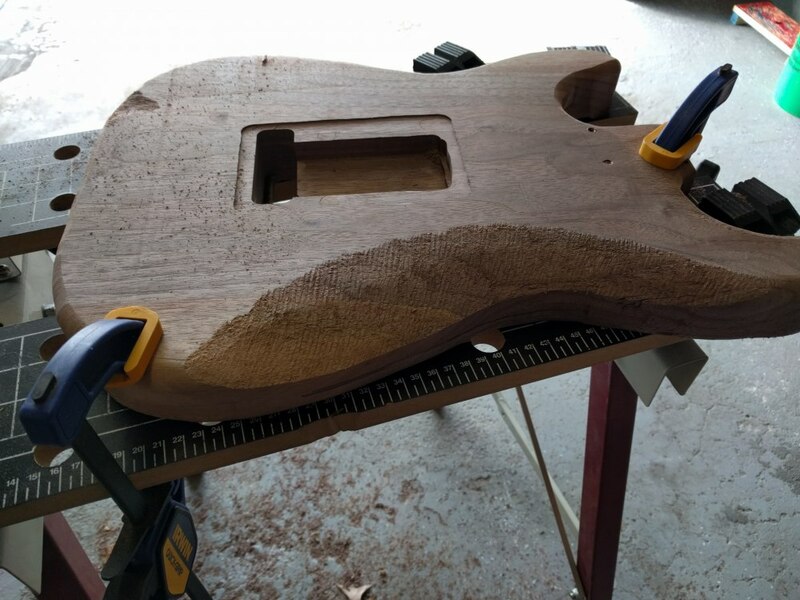 But the bit only needs to catch on something - catching a sidewall a little too deep, or maybe catching a piece of wood in the chamber the router has missed (and that's very easy to unwittingly do) and it will kick. When it kicks, it is absolutely uncontrollable and there are only two results: serious damage to the guitar or serious damage to soft tissue. It can even happen when you are using a template if the bit goes in a little too deep or a little too fast. That's the thing about the physics associated with safe routing. The pressure of a bearing or fence against the workpiece means that anything which can cause it to kick is minimised. A free-floating tool with no directional pressure is liable to go in any direction that it is told to; easy to follow a pencil line however like Andy says. One catch and BAM. You're holding an angry wasps nest trying to catch it by the non-deadly end. I exaggerate a little here....but not by much in the interest of safety. As instrument makers, we should value our string pokers. 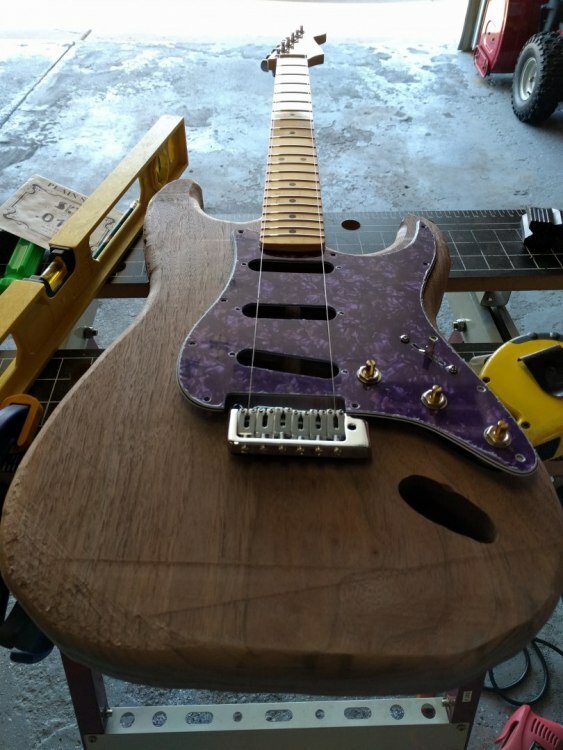 Don't worry, I think I'm done routing on this project! I'm surprised you're not more scared of the router in that case! Ye cannae change the laws of physics, Jim. 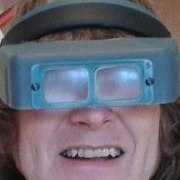 Several hundred watts of power concentrated into a rapidly spinning and very sharp chunk of metal? Yes, I'm very careful when I use my router, and try to minimise any element of "luck"
A 19mm diameter cutter (my main template bit) running at 10,000RPM (slow) still manages 10m/s (33ft) at the cutters. Three times that at full whack. Also, this is all concentrated on a sharp edge twice per revolution. When things go wrong, they go wrong VERY quickly. I demonstrated this by feeding a strip of wood trapped between the cutter and a table router fence, which you obviously NEVER do. Firstly it pulls the wood (and you) in, then ejects the wood at a couple dozen metres per second (if the motor doesn't bog down under pressure). Not quite relativistic speeds eh, @pan_kara? If that were the case, then the air in front of the wood wouldn't be able to move out of the way quickly enough, causing it to heat up into a plasma causing spontaneous fusion, X-rays and a nuclear fireball. This is entirely why I respect routers. What is the reason for routing without a template? Well the real reason is my Rockwell Bladerunner didn't have enough room on the side of my template that I drew on to get that corner...then I said, "How steady can I be?" Apparently, dangerously steady! 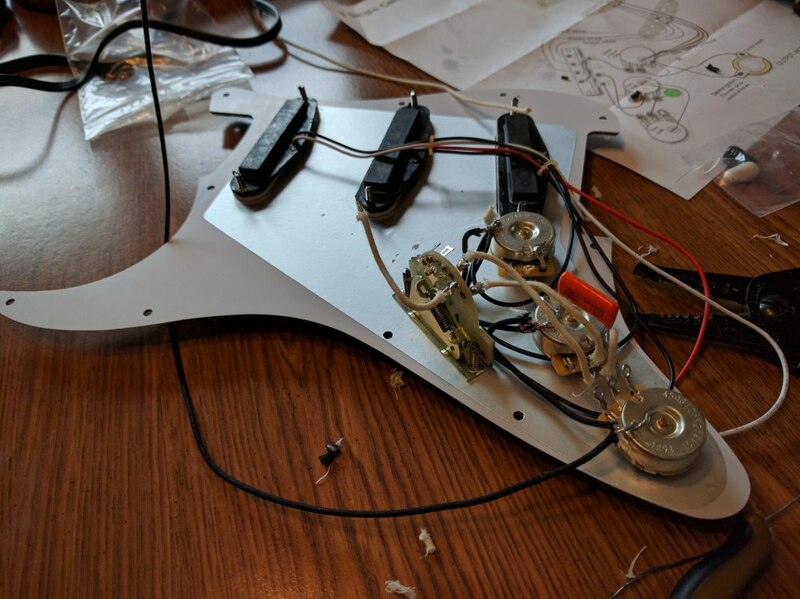 It was crappy out, so I wired up the pickguard. I also tested it by holding it up to my Tele. P.S. I still hate soldering ONTO pots. Looks good! 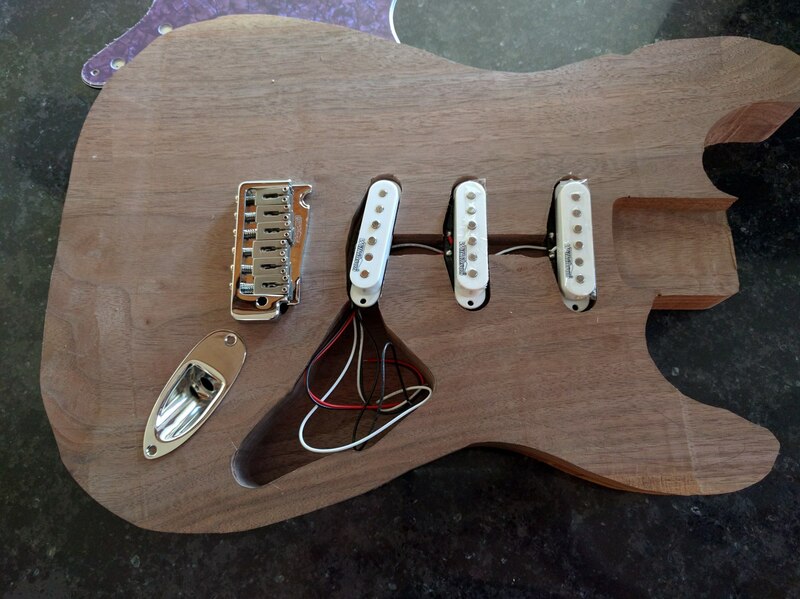 Are those Wilkinson pickups? 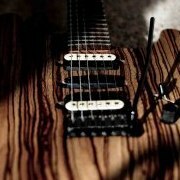 I have a set of them in one of my project strats and they sound good! They are...I was looking at some Fender Americans, but I mostly a bass player so $31 seemed a lot more reasonable than $200. I was also spec'ing the pots and switches out at mouser/digikey and found a guy selling a grade A kit for $30 on amazon, say $5/pot and $12+ for the switch with wire with free shipping...good deal. Haha I'm the other way round. A guitar player who's sourcing bass parts for my next project. I didn't know bass hardware is so much more expensive!